Agent Jerry informs Ricky that magazine writer Eleanor Harris will arrive at 7AM the following morning to interview the "happily married" Ricardos for an "average-day-in-the-life-of" story. 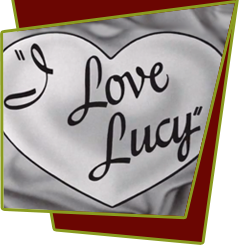 The average day starts out with Lucy, in a lavish lace apron, cooking breakfast for Ricky "darling", who enters the kitchen in a smoking jacket, exclaiming, "Oh, I didn't know we had company. I woke refreshed, and with a song on my lips." On the guise of borrowing a cup of half-and-half, earring-clad Ethel arrives, followed shortly by Fred, who sports a suit, tie, and derby "to fix the faucet." The 'average day' continues when Jerry informs Ricky he's sent out three thousand invitations to ladies on the Tropicana mailing list, signing Ricky's name to them and inviting each of them for dinner and dancing as Ricky's "date". When Lucy discovers a sample invitation (inscribed to Minnie Finch) in Ricky's jacket pocket, she flies into a rage and takes Ethel with her to search for this Finch woman. Minnie Finch, like her neighbors, is a slovenly dressed old lady. Lucy is properly relieved when she finds out it was just a publicity stunt, and the Ricardos return to their "happily married" state once again. Special Notes: Eleanor Harris was a real magazine writer who wrote about Lucy and Desi as far back as 1940. She also authored a paperback book titled "The Real Story of Lucille Ball" that was published in 1954, about the time this episode was aired. Minnie Finch was played by Kathryn Card, who, almost thirty episodes later, would play Lucy's mother, Mrs. McGillicuddy. This is Jerry Hausner's last "Lucy" appearance. He had been in the pilot and many early episodes, but a shouting match between Desi and him during the filming of this show caused an irreparable rift. Bloopers: When Fred comes over to fix the pipes Lucy says she told Ethel about it two years ago, but the Ricardos have only been in that particular apartment for less than a year.